ROTHESAY (AUS) (Bay 2006-Stud 2011). 4 wins-1 at 2, Queensland Guineas, Gr.2. Sire of 252 rnrs, 141 wnrs, inc. SW Havasay (Clarence River JC Ramornie H., L), In His Stride, Too Good to Refuse, SP Over Exposure, Scottish Rogue and of Bring it Home Pop, Beloso, Kit de Luca, Prioritise, Jacksay - Fionesay (H.K. ), Oberland, Shadow Lawn, Shotacross the Bow, Enterprise Moss, Sir Barnabus, Engraved, Heart of Australia, Invicta, Iron Craft, Jadentom, etc. Nivo (f. by Rothesay). 2 wins-1 at 2-at 1200m, 1300m to 2018-19 in Aust. GOLDEN CHATEAU (Chateau Istana). 2 wins at 1400m, 1600m, R764,325, Turffontein Gauteng Guineas, Gr.2, 3d Greyville KRA Guineas, Gr.2. Pinot Girl. 6 wins. See above. Gold Attire. 6 wins from 1400m to 2850m, A$222,900, VRC Lexus Welter H., Great Western H., Sister Olive H., MRC Prince Salieri H., 2d MRC Summer Fair H., VRC Brian Beatie H., Banjo Paterson H., Elounda Bay H., 3d MRC Trudy Birchall H., 4th Ballarat Cup, L.
American Jewel. 5 wins at 1400m, 1700m in U.S.A. and NZ, 3d ARC Graeme Thomson Jewellery 3YO H.
Mont d'Or. 2 wins at 2000m, 2500m, R178,200, 2d Greyville FFS Refiners H., 3d Clairwood KZN Chapter Winter Challenge Finals 2000. General Shek Po. 6 wins from 1100m to 1800m in Macau. Golden Spires. Winner at 1100m in Aust. Emerald Hills. Winner at 2 in NZ. Tom O'Forbes. Placed at 3 in NZ. Gorgeous Weather. Winner at 1m in U.S.A.
Dual Jewels. 14 wins from 6f to 8½f, US$238,490 in U.S.A. Bold Approval. Winner at 6f in U.S.A.
Tasha. Winner at 8½f in U.S.A. Producer. Accent on Gold. Winner. See above. FAST TOPAZE (Far North). Third top colt on The 1985 French 2YO Free H. 4 wins at 1600m, 2100m, Longchamp Poule d'Essai des Poulains, Gr.1, Prix Lupin, Gr.1, Criterium de Saint-Cloud, Gr.2, Longchamp Prix de Fontainebleau, Gr.3, 3d Longchamp Prix du Prince d'Orange, Gr.3. Sire. Peak Value (Blushing Groom). Winner at 1600m, 3d Saint-Cloud Prix Edmond Blanc, Gr.3, Grand Handicap de Deauville, L, Deauville Prix Yacowlef, L, Prix du Cercle, L. Sire. IN BLOOM (Brocco). 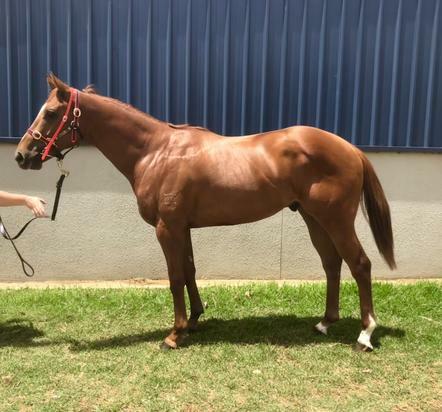 5 wins at 1200m, 1400m in Malaysia and Singapore, Singapore TC Stewards' Cup, L, Class 4 H., 3d Singapore TC Class 3 H.
Saramenha (Snitzel). 2 wins at 2, A$211,780, STC Kyle & Jackie O Show 2YO H., Kidney Health Week 2YO H., 2d BRC Hampden S., L, STC Asbestos Disease Foundation of Australia 2YO H., ATC N&A Fruit Distributors H., Rydges Parramatta H., 3d ATC Schweppes H., Canterbury Park H., 4th BRC Doomben Slipper, L. Producer. Star of Normandie (Gulch). 4 wins from 1m to 1¼m, 2d Doncaster Gillies S., L, 4th Newbury Fillies Trial S., L. Producer. Pillatus (Black Cash). 2 wins at 1200m, 1400m in India, 3d Mumbai Breeders' Juvenile Colts Championship, L, Pune FD Wadia Trophy, L.
BLUE TOM (Tompion). 5 wins-3 at 2-from 1000m to 1800m, Longchamp Poule d'Essai des Poulains, Gr.1, Prix de la Salamandre, Gr.1, Le Tremblay Prix Daphnis, Gr.3, 2d Deauville Prix Morny, Gr.1, Longchamp Prix de la Foret, Gr.1, Prix de Fontainebleau, Gr.3, 3d Longchamp Prix du Rond-Point, Gr.3, 4th Saint-Cloud Prix Perth, Gr.3-twice. Sire. AMBER RAMA (Jaipur). 4 wins-3 at 2-to 1200m, Deauville Prix Morny, Gr.1, Maisons-Laffitte Prix Robert Papin, Gr.1, Royal Ascot King's Stand S., Gr.2, 2d Longchamp Prix de la Salamandre, Gr.1, Maisons-Laffitte Prix de Seine-et-Oise, Gr.3, 4th The Two Thousand Guineas, Gr.1. Sire. TIMMY MY BOY (Tompion). 5 wins-1 at 2-at 1600m, 2000m, Saint-Cloud Prix Eugene Adam, Gr.2, Longchamp Prix de Fontainebleau, Gr.3, 2d Chantilly Prix du Jockey Club, Gr.1, Longchamp Prix d'Ispahan, Gr.1, Prix d'Harcourt, Gr.2, 3d Longchamp Grand Criterium, Gr.1, 4th Sandown Eclipse S., Gr.1. Sire. PINFLORON (Caerleon). 8 wins from 1600m to 1700m, US$649,059, Hollywood Park Shoemaker H., Gr.2, Chantilly Prix de Saint-Patrick, L, Bay Meadows Once Over Farm H., L, 2d Santa Anita Arcadia H., Gr.2, Evry Prix de Pontarme, L, 3d Santa Anita El Rincon H., Gr.2, Hollywood Park Lure H., L, 4th Maisons-Laffitte Prix Messidor, Gr.3. PINMIX (Linamix). 5 wins-2 at 2-from 1100m to 1600m, Chantilly Prix La Rochette, Gr.3, Prix Servanne, L, Longchamp Prix de Montretout, L, 3d Longchamp Prix de Fontainebleau, Gr.3. Sire. PINAKARAL (Akarad). Winner at 2, Saint-Cloud Prix Thomas Bryon, Gr.3. Sire. WON MORE MOMENT (Super Moment). 9 wins-3 at 2, River Downs South Bound S., L, Turfway Park Banner Bob S., L.
BURNING VOLCANO (In Fijar). 6 wins, Delaware Park Charles Staats Memorial H., L.
Optical Grey (Native Dancer). Placed, 3d Longchamp Prix de Fontainebleau, Gr.3.